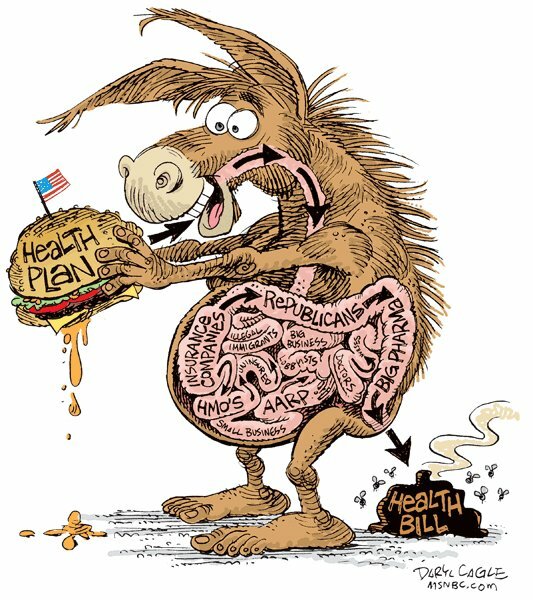 Any hope the Harry Reid will now put the public option and Medicare buy-in back in the bill to appease Sanders and win over his vote? The House passed a temporary two month fix of the Medicare Payment Formula on Wednesday, attaching it to the 2010 Department of Defense Appropriations Act (HR 3326). The bill continues current Medicare payment rates for an additional two months to avoid the 21 percent cut in physician reimbursement which the flawed formula would call for. The Senate is scheduled to consider the bill on Saturday. The two month delay would give Congress more time for a longer term fix. Congress has acted annually to prevent the cuts which the formula would result in. This year Democrats attempted to pass a permanent fix but this got caught up in the politics of health care reform with Republicans blocking their efforts. Failure to prevent the cuts would result in large numbers of physicians being forced to stop seeing Medicare patients, greatly limiting access to health care by the elderly and disabled. Seeing good ideas being removed from the health care reform bill, such as the options for people to either buy into Medicare or purchase a publicly run health insurance plan if they choose, has been very discouraging for many on the left. Until we see the final health care reform bill it remains premature to say whether the final bill will still be worth supporting, but many are already taking sides. Rockefeller said that compromises would be necessary, and that Democrats would come back with more attempts at health reform, perhaps as often as every year. “No, I look at the bill and say what is in the interest of the people in my state,” he added. While there are many benefits to both the public option and Medicare buy-in, neither should be the sole litmus test for support. Countries such as the Netherlands and Switzerland mandate the purchase of private health insurance without a public option.What is necessary is that there be adequate regulation of insurance companies so that they can no longer operate based upon a business model of profiting by denying coverage. Howard Dean’s 2004 plan did not include a public option, but there is also another key difference between his 2004 plan and today’s plan–the mandate. It is far harder to require that individuals purchase insurance without offering choices such as the public option. I have opposed the individual mandate throughout the health care debate. Now many on the left are arguing against this, including Democracy for America and Markos Moulitsas. Whether the presence of a mandate is a deal killer also depends upon the nature of the mandate. While philosophically I oppose mandates, I can also accept the case that there be a tax on those who do not pay into the system since this does lead to increased government expense when the uninsured do wind up needing health care. Recognizing that compromise is necessary, I can accept a very weak mandate such as being discussed in the Senate with rather nominal fines going up to around $700. There would also be the possibility to opt out if it does turn out that one truly cannot afford to purchase insurance despite the subsidies which will be offered. To put this a bit more sharply, if I could construct a system in which insurers spent 90 percent of every premium dollar on medical care, never discriminated against another sick applicant, began exerting real pressure for providers to bring down costs, vastly simplified their billing systems, made it easier to compare plans and access consumer ratings, and generally worked more like companies in a competitive market rather than companies in a non-functional market, I would take that deal. And if you told me that the price of that deal was that insurers would move from being the 86th most profitable industry to being the 53rd most profitable industry, I would still take that deal. And that may be the exact deal we’re getting. The profit motive is not, in and of itself, a bad thing. The Apple computer I’m typing on, the Netflix movie I wish I were watching, the pork buns I wish i were eating — it all comes from profit. But Apple isn’t allowed to have slaves build its computers, Netflix can’t destroy the incentive to make films by pirating all of its DVDs, and Momofuku can’t let rats infest its kitchen because exterminators are expensive. Health insurance suffers from market failure in part because it suffers from regulation failure. We’re adding the regulations now and we’ll see, in 10 years, whether people hate insurers somewhat less, or whether they’ve embraced the nonprofit model, or whether they’re clamoring for public insurance. Either way, putting insurers into a structured market where they’ll have to compete against one another and users will rate them should make things a lot better. Public insurance might be the best way forward, but an insurance market that works for consumers is progress nevertheless. Disappointed progressives may be wondering whether their efforts were a waste. They most decidedly were not. The campaign for the public option pushed the entire debate to the left–and, to use a military metaphor, it diverted enemy fire away from the rest of the bill. If Lieberman and his allies didn’t have the public option to attack, they would have tried to gut the subsidies, the exchanges, or some other key element. They would have hacked away at the bill, until it left more people uninsured and more people under-insured. The public option is the reason that didn’t happen. And if public option supporters lost in the Congress, they won in the country as a whole. The underlying political problem for liberals remains what it has been for a generation: profound and widespread distrust of government. But polls consistently showed voters thought the public option advocates were right–that, at least when it comes to health insurance, government can be trusted. It was a small victory, but it’s on top of such small victories that political movements are built. Someday in the future, that movement may be powerful enough to win more sweeping changes. Who knows, maybe those changes will include a government-run insurance plan. Nate Silver has a number of additional questions which those who oppose the plan should consider while Glenn Greenwald believes that a weak bill is what Obama really wanted all along. The real question might turn out to be not what is contained in the Senate bill but what ultimately comes out of reconciliation with the more liberal House bill. Update: Bernie Sanders warns he will not support the Senate bill in its current form and Keith Olbermann’s Special Comment opposing the current Senate bill. Update II: Some conservative blogs are linking here spinning recent events by erroneously describing it as liberals coming around to their view in opposing mandate. Actually views on mandates did not line up based upon party or ideological lines. There were Democrats on both sides of the issue while the individual mandate was supported by Congressional Republicans. I suspect that conservatives outside of Congress, who don’t personally benefit from contributions from the insurance industry, might have been more likely than Congressional Republicans to oppose the mandate. Unfortunately Democrats thought they had a deal with the insurance industry to support reforms such as eliminating exclusions for pre-existing conditions in return for backing the individual mandate. The folly of dealing with the insurance industry should now be quite clear. Senator Bernie Sanders proposed an amendment to establish a single-payer health care system. Tom Coburn responded by requesting that Sanders’s 767-page amendment be read in full on the Senate floor. Sanders tried to dispense with the reading but Coburn exercised Senate rules to force this to proceed in an effort to slow down consideration of health care reform on the behalf of the Republicans. I know there is no chance of this happening, but wouldn’t it serve them right if reading the full amendment changed some minds and it actually passed? The conservative movement has moved so far to the extreme right that the Birchers are no longer too extreme for them. With conspiracy theories becoming typical of conservative thought, they are quickly moving into the mainstream of the movement. Years ago leading conservatives such as William F. Buckley, Jr. worked to exclude far right wing extremists such as those in the John Birch Society from the conservative movement. A couple of years ago I noted how the Birchers were becoming more acceptable among conservatives, noting Ron Paul’s support for the organization and Glenn Beck publicly saying how the Birchers were “starting to make more and more sense” to him. Sarah Palin has even posed with a copy of The New American, the publication of The John Birch Society, prominent on her desk. The connections between the John Birch Society and the conservative movement are becoming even stronger with the group now announcing that they are cosponsoring the Conservative Political Action Conference (CPAC) 2010, to be held in Washington DC, Feb. 18-20. There are many, many reasons why Sarah Palin should never become president and preferably should stop making idiotic public statements. While not top on the list, somewhere we need to add one more–saving the tomatoes. The more Sarah Palin is on the road, the greater the risk that we will not be able to make BLT’s and our salads will lack tomatos.